The ch�teau has been lovingly restored to meet contemporary standards of comfort and convenience, without sacrificing historical integrity. It enjoys modern facilities that include a well-equipped modern kitchen and under-floor central heating. Nevertheless, it retains its medieval character, with massive stone walls, beamed ceilings and huge fireplaces in the spacious, interconnecting rooms. 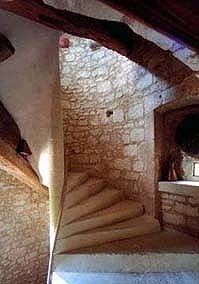 Four levels are united by a large stone spiral staircase within the semi-octagonal tower. In summer, when most activity is outside, the large, secluded swimming pool (5 x 10 m.) is a natural focal spot. Views across the river valley from the pool patio are spectacular. Underwater lighting enables the pool to be used at night. There are five bedrooms, four bathrooms, two en suite and one shared between two rooms. A spacious, high-beamed room next to the kitchen, and opening onto the garden with a monumental Fourteenth Century fireplace. The Great Hall still serves its original pyurpose as a dining room. In summer, particularly on warm evenings, most meals can be taken al fresco on the north terrace. Well designed, and fully equipped with dishwasher, stovetop, convection oven, microwave and refrigerator, the kitchen conveniently adjoins the dining room without distracting from the mediaeval ambiance. This large space currently serves as a sitting room and games room. 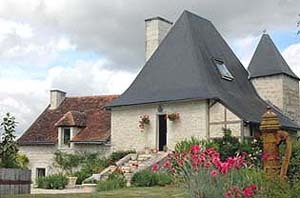 The ch�teau has four bathrooms and four blavatories. The master bathroom has two sinks, a shower, and a jacuzzi tub. The door gives direct access to the old moat terrace. 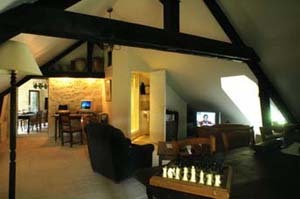 A lofty room with double bed at the top of the tower, enjoying superlative views over the valley. 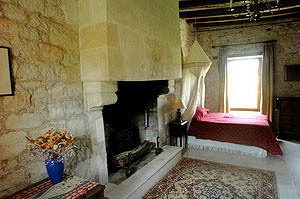 A large room with double bed, dominated by a fine renaissance fireplace. The large West window gives sweeping views across the valley and makes this a very light room. En suite bathroom (Jacuzzi & shower, separate toilet). Private access to the East terrace. 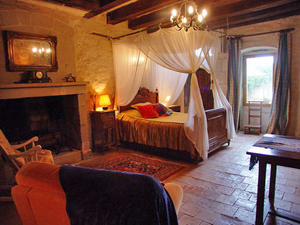 A magnificent twin-bedded room with fine Fourteenth Century fireplace. En suite bathroom (with shower) and separate toilet. It enjoys fine views and has private access to the circular North Terrace. 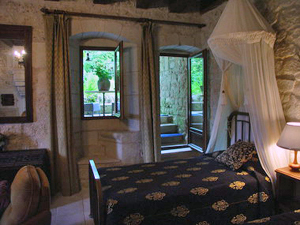 A spacious room at the foot of the tower, with double bed. Private access to the West Terrace. A short flight of steps leads down through a curtained Norman archway to the cellar alcove. Shared en suite bathroom (shower) & toilet. An small attractive room of character, with French Windows opening onto the West Terrace. Double bed. Shared en suite bathroom. 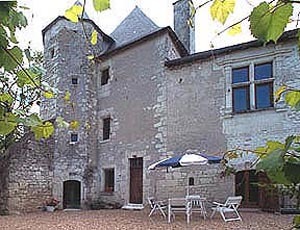 The Château lies just south of the Loire Valley between the great historic cities of Tours and Poitiers. For almost a thousand years the Château has dominated the valley of the river , where the historic regions meet - This is where the Hundred Years War saw its most ferocous action. Standing on a wooded bluff overlooking the river, the ch�teau enjoys breathtaking panoramic views across the surrounding landscape. The nearest large town, Chatellerault, is a 20-minute drive away, and can be reached by TGV (high-speed train) from Paris (Montparnasse) in an hour and twenty minutes. There is also TGV service to Poitiers direct from the airport (CDG). RyanAir has regular flights between London (Stansted) and Poitiers (Biard), often at low fares. 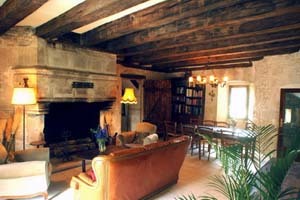 The Château lies in beautiful, tranquil countryside an hours drive from the magnificent châteaux of the Loire Valley. Many attractions are to be found within easy distance. The existing buildings incorporate part of an older castle from the time of William the Conqueror in the Eleventh Century. 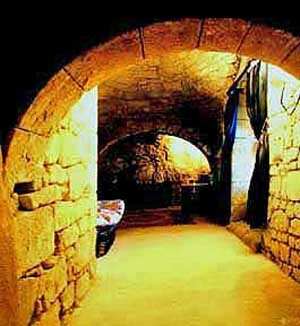 Cellars, with their rounded Norman arches, remain from this period. 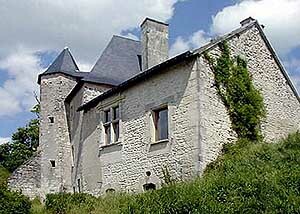 At one time the Château was larger than it is today, and is believed to have possessed four towers. The present buildings show evidence of this former glory. 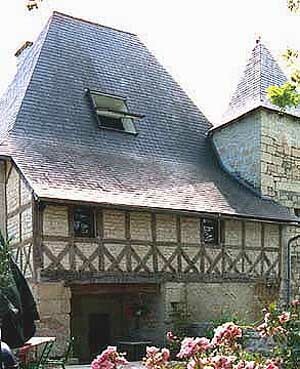 A new wing, with its large Renaissance window and fine fireplace, was added in the Sixteenth Century. It was furnished with a moat and drawbridge before the French Revolution. The châteaubelonged to one of the great noble families of the Poitou, whose members held high office under France's most illustrious kings. The buildings today date mainly from the Fourteenth to Sixteenth Centuries, and include what was originally a small chapel, with a sealed crypt. Walkers, cyclists, horse-back riders and naturalists enjoy the network of ancient trails and footpaths that weave through the surrounding woods and fields. Local rivers provide delight to swimmers, kyakers and canoists. Not far away is an olympic-class white-water canoe course. 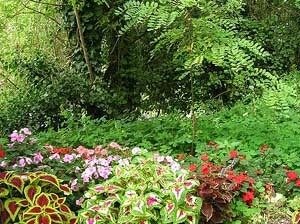 Rock climbing is popular on the limestone cliffs For naturalists, and especially bird-watchers, the Brenne Regional Park, with its profusion of wildlife, is a special attraction, as is the famous Marais Poitevin or Green Venice. Located near the attractive Atlantic seaport of La Rochelle, one can rent a boat to explore a network of ancient canals that permeate the marshes. 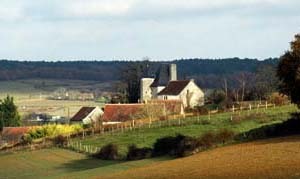 Villages, hamlets and farms that dot the landscape are filled with architectural delights. Throughout the summer months there are local concerts, recitals, and art exhibitions, together with village fêtes and firework displays. Among the many historic and architectural gems of the region are the great châteaux of the Loire Valley, about an hours drive to the north. Caves in the limestone cliffs along the river valleys show evidence of human occupation dating back more than 30,000 years. 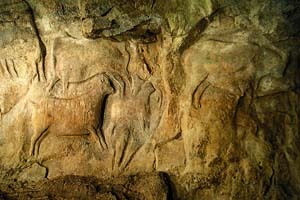 Most striking are the bas-relief figures discovered in the Abri du Roc-aux-Sorciers near Angles-sur-lAnglin. Dating from the end of the last Ice Age. 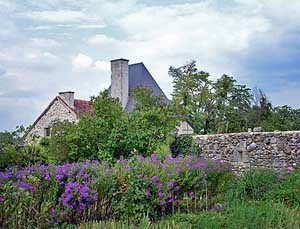 The nearby château at Le Grand Pressigny houses a fine museum of prehistory. The abbey of St. Savin, and the village church at Antigny, possess some of the finest mediaeval frescos in Europe. In the great Merovingian necropolis at Civaux, hundreds of giant stone coffins litter the ground. These date from the famous battle in which Clovis, King of the Franks, defeated the Visigoth warriors of Alaric in 508 AD. A new museum at Civaux provides an introduction to the pre- and early history of the region. In the cliffs above St. Remy, a short distance away near Descartes, an extensive troglodyte village includes many dwellings that are still occupied. Angles-sur-lAnglin, with its striking ruined cliff-top château, is widely acknowledged as one of the most beautiful villages in France, and attracts many artists. Monks at the ancient Benedictine abbey of Fontgombault are renowned for their daily services, accompanied by l Gregorian chant. Less than an hour away, near the historic city of Poitiers, is Futuroscope, a popular theme park devoted to the moving image, in which the latest film and computer-graphics technologies may be experienced. The area is a focus of gastronomic excellence. There are restaurants of exceptional quality (and modest price) within easy distance. There are outstanding village inns in the neighborhood that serve excellent 'family style' meals. Local wines abound at high quality and low prices. Weekly markets in nearby towns offer a profusion of delicacies, including local wines, cheeses and pâtés, together with fresh fruits, vegetables and seafood. The region is particularly renowned for its goat cheeses. The ch�teau is located near the attractive spa town of La Roche Posay, which has been famous since Roman times for the healing properties of its medicinal waters. These waters are still valued today and our visitors can enjoy luxurious bathing, massages, facials, and other indulgent therapeutic treatments. La Roche Posay is the home of world-famous skin care products. This unspoiled region holds many wildlife attractions extending from the Brenne wildlife sanctuary, to the Atlantic seashore and the great châteaux of the Loire Valley. Angles-sur-l'Anglin - "the most beautiful village in France"
Abri du Roc-aux-Sorciers near Angles-sur-lAnglin.